The plainsong music in this collection consists of extracts from medieval masses and offices to St. Henry, recounting part of his legend. Bishop Henry, the patron saint of Finland, is held to be the principal founder of the Church of Finland during the 12th century. Traditional lore has it that he became the first bishop of the diocese of Turku (which comprised all of Catholic Finland). Previously Bishop of Uppsala in Sweden, he would have taken part in King Erik Jedvardsson's military expedition to Finland and stayed on to preach and build up the Finnish church. 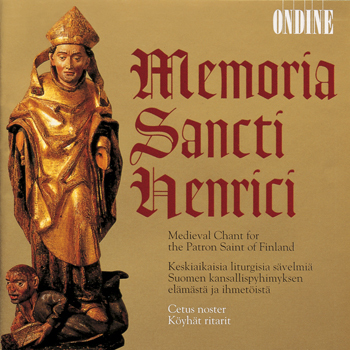 This recording was made at the Suomenlinna Church in Helsinki. The two ensembles performing together - Cetus Noster and Köyhät ritarit ("Poor Knights") - have specialized in Gregorian chant since the mid-1980s.